Happy 20th Birthday, The Idler! Where do you get your ideas from? If you’re working all day, it kind of kills a lot. So daydreaming is a productive activity. It’s also about visualising your ideal world, both the kind of world you live in and also who you want to hang around with and what you want to spend your time doing. My ideal world, which I’ve been thinking about for 10 years, is the film world, where I can make films and watch movies and be around creative people. When I was 17, I remember thinking, ‘My whole life is anticipation, everything I’m doing in school is to serve some future purpose.’ All people would say is, ‘What are you going to do when you grow up?’ Wait – you mean we’re not people right now? You’re being moulded to be a little drone-worker in the system. Thus spake Dazed and Confused filmmaker Richard Linklater, interviewed by a young Idler in 1994. The Idler has come of age and, to celebrate, they’re releasing a collection of fifty interviews with fabulous bohemians and idle thinkers from the magazine’s capacious archive. You can order a copy here. There’s also a smashing sample from the volume in the Independent today. The Idler was, of course, a major part of the inspiration for New Escapologist. Their editor, Tom, also gave us some good breaks by recommending us to his readership, by allowing me write for his magazine, and doing an event with us in Glasgow. Since it began in 1993, the Idler has evolved into a high-quality annual of joyful, counter-cultural essays and an entire enterprise in the form of the Idler Academy. Long may they flourish! But effortlessly. I’m always happy to have visited New Escapologist–it’s never a waste. Never heard of The Idler, and will now look out for it! Thank you! 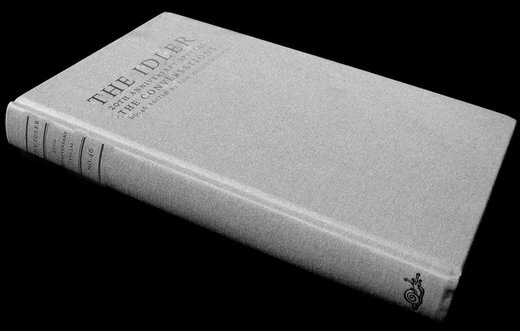 The Idler is wonderful. I recommend the ‘War on Work’ issue, the ‘smash the system’ issue and the ‘How To Be Free’ spin-off book.